We recently caught up with Kevin Deplanche and Joe McGurk of the promising progressive metal outfit Opposing Motion who saw their albums “Laws Of Motion” released earlier in 2013 via Lion Music. Many thanks for agreeing to this interview and congratulations on the birth of “Laws Of Motion”. Many thanks to you and VirtuosityOne for your interest in OPPOSING MOTION’s music! Can you give us an overview of the bands background and how you’ve built up to the release of “Laws Of Motion”? Kevin: OPPOSING MOTION was created when Joe and I met around a few beers in late 2005 and found out we had more than a few common musical influences rooted in early Malmsteen, Blind Guardian and Stratovarius. 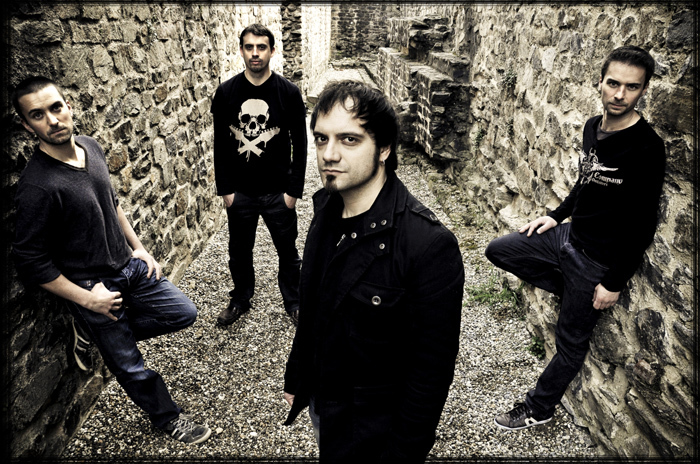 We quickly started writing original material, pushing each other and integrating more prog-metal influences as we went along until we decided to record a-5 tracks E.P called “the Illustration” which was released in mid-2010, bringing in French singer Ludovic DeSa. This E.P received great reviews both in the UK and internationally and we quickly got given the opportunity to record a full debut album. 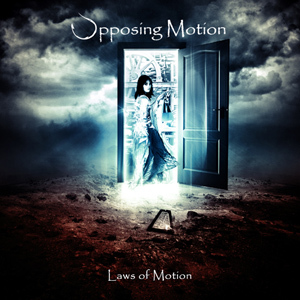 “Laws of Motion” was written and recorded in late 2011 until mid-2012 and by this time the full line up (with my brother David on bass) was confirmed, we all could participate to the writing process. We were extremely excited to land a good first album deal with leading prog label Lion Music who released “Laws of Motion” in May 2013. Joe: It may seem that we have taken our time with this release, having formed when we did, but things have never really felt that way. It always takes longer than you anticipate getting a stable line-up that fits the direction of the music and we wanted to guarantee that we took our time and were happy with the tracks. The end result has certainly been worth the wait as far as we are concerned. How does being a half English/half French band work out and what do you think both nationalities bring to the band? With modern producing and recording tools, we can work very efficiently and we speak pretty much everyday to discuss things surrounding the band. Organising gigs and video/photo shoots is a bit more demanding in terms of logistics but so far we have managed to make it work pretty well. The next step is to organise some gigs and we are working on this! Joe: The Six Nations Rugby has kept me happy for a fair few years though, but in all seriousness I think geographical spread within bands is actually quite common in the prog genre. This may be due to the fact that it is not easy to find musicians who firstly enjoy this style and secondly can actually play it. We have the usual banter between England and France but it is all good fun. As a four piece you cover a lot of ground in terms of musical textures, density and overall expression. How do you go about finding the Opposing Motion sound? Kevin: The concept for OPPOSING MOTION was to not confine ourselves to a specific genre in an attempt to digest as many influences from our musical heroes and create the album we would have liked to listen to ourselves as metal fans first and foremost. We listen to and play a wide range of music and, although OPPOSING MOTION’s music is deeply rooted in the metal scene, we love to explore different sound textures and arrangements akin to what the band ARK did with their two albums. From the reviews of “Laws of Motion” we saw, this approach can maybe be a bit “daunting” at first for the listener as the album does require some time before it opens up….and that ‘s where the real journey starts! Joe: It is not something we actively sought but I reckon if you get passionate musicians together and let individual influences merge then a unique output will happen. We always wanted to write songs that we wanted to listen to rather than conform to a set style and it seems that this has given us a unique sound which is great in my opinion. I feel you have a quite unique sound in a lot of aspects, there is plenty for fans of other bands to latch onto but the end product is original. Is this originality a help or a hindrance in the grand scheme of building a career? Kevin: We are extremely pleased to be noticed for our originality but as you mention…in the grand scheme of things, and in terms of developing a following, the complexity of our music may play against a rapid career development. To be extremely honest, we do not think too much about this yet. I think we would be very happy to slowly build a following of fans that appreciate and possibly look for this certain musical depth instead of taking a quick and easy route that may not fulfil us fully as musicians. Joe: Yes, I guess there is always a mixture of responses, you are either criticised for not sounding like you should or similarly for not being original. We will certainly keep trying to improve and keep doing what we feel is the right path for the band and our music. On the album’s creation how does Opposing Motion generally construct a song? Kevin: “Laws of Motion” is the fruit of almost 5 years work and, although all four of us had the opportunity to bring its own personality into each track, many tracks were in advanced demo stages by the time the track list for the album was finalised. Most of them started as simple jams between Joe and myself, then later developed into full songs. Others like “Las Lagrimas del Diablo” were pretty much brought by Joe on his own. Generally speaking, one of us will bring a theme, a riff, a rhythmic part or even a full proposed track structure and we all take it from there, bouncing ideas to each other to try to construct a full track. This often leads us to strange places and is at the same time a great technical challenge where parts can get pretty crazy like on “The Fallen Opera”…this is what makes OPPOSING MOTION so much fun! Joe: As Kev says, we like to initially collate parts to lay down a skeleton, whether that is orchestral or around a big riff or chorus. We then work around this and make sections more complex but never going away from the main melody. Verses and bridges then seem to fall into place and before you know it, section by section, we have a track! Do you work on more than one track at once or prefer to focus on the one task at hand? Kevin: Absolutely! Joe is an extremely prolific writer and at times can send us pretty much a full 10 min of new music per day! I myself like to try to channel this creativity and prefer to focus on 2-3 tracks maximum at the same time to keep ideas fresh when hearing new material for the first time. I like to sit behind the kit and do a few takes without knowing the track, finding the most natural grooves before making them more complex as I get more familiar to the material or suggest structural changes etc. Can you give us any examples of how a writing method changed for the tracks on “Laws Of Motion”? Kevin: As I mentioned before, I would say that most tracks on “Laws of Motion” already existed before we decided to record the album – even in a very early incarnation for example a simple chord progression of a symphonic part (on the track Laws of Motion), tracks that we had written after the recording of the EP and were there at 99% (Labyrinth of Mirrors), or early tracks that we reworked from the ground up (Echoes of the Soul). So most of the hard work was done. The Fallen Opera was a different beast though…Joe brought this ambitious track pretty late in the process and presented it to us as a full progression. It sounded so epic that we decided to include it in “Laws of Motion” and this is the first track were all four of us had equal input in terms of ideas, lyrics, structure etc. We are very pleased by the final result and it is a great taste of the things to come as we write more tracks as a full band. Joe: I agree with Kev but if I had to single one out that was different I would go with the title track. Usually we have too much happening and too many ideas but the title track of the album was written differently than the others as we built it up rather than reduced down. Please give us a track-by-track rundown of the album with your thoughts on each track. Forever’s Edge: Most definitely the easiest way to enter our sound. Forever’s Edge is a classic power-prog track that featured already on our “Illustration” E.P and has always earned us glowing comments. The track is fairly straightforward by Opposing Motion’s standards and gives Ludo, our singer, the spotlight. The opening solo shows some Malmsteen inspiration while the fast drums beat is a tribute to the track “Red sharks” by the mighty CRIMSON GLORY. Labyrinth of Mirrors: One of the strongest tracks of the album, Labyrinth is exactly that…a tortuous track that leans a lot towards early FATES WARNING material with John Arch, alternating four to the floor and faster sections with many odd time signatures during the breaks. Ludo shows his versatility on this track, from spoken parts to high screams, while Joe’s solo is pure virtuosity, cleverly linking the two main sections before the finale. A track that is strongly reminiscent of early SHADOW GALLERY, one of our favourite bands. Las Lagrimas Del Diablo: Another track that has been with us for a few years but, contrary to others, not a single note has been changed through the years as it felt complete since day one. Ludo’s strong appreciation of Roy Khan can be heard here and the track itself is not too far from the tasteful ballads of early KAMELOT albums. The presence of a ballad is sometimes seen as a cliché in a metal album. For us it was a necessary breather for the listener given the density of the album. Rites of Passage: Probably the most progressive (and complex!) track of the album. Rites can sometimes be seen as a musician’s capital sin where technique and complex time changes take over the overall melody akin to what was doing a band called POWER OF OMENS…but we do like to think that there are enough melodic hooks in the track to grab the listener. The track is certainly led by vocals and features a strong chorus and very personal lyrics. The heavy use of synths and more measured pace brings it closer to prog rock than metal and shows our love to this scene: ELP, WAKEMAN, YES and later bands from the Neo prog movement and bands like PALLAS, ARENA, ARAGON, MARILLION. Laws of Motion: The second breather of the album, the title track is an atmospheric pause led by vocals, orchestral arrangements and subtle guitar parts. In hindsight, we probably could have developed this track, which shines from its chorus, into a full piece. This track is musically strongly linked with the instrumental track “the Illustration” from our first EP, which put the band into the spotlight in 2010 because of the very intricate parts. The Fallen Opera: The final track and “piece de resistance”! The Fallen Opera was originally near 15 mins long but we decided to cut it down to a more reasonable 10 mins to make sure we could nail all the arrangements. We wanted to have a go at producing an epic track, which would contain all the trademark elements of OPPOSING MOTION – strong guitar-driven melodies supported by discrete orchestral arrangements and complex rhythmic layering. The Fallen Opera is a good representation of the overall direction of the band, although we want to improve further on our overall sound to make it fuller, more accessible in parts through bigger vocal hooks and riffs. The Fallen Opera is the perfect closure for “Laws of Motion” and, at the same time, the beginning of a new journey as we started writing new material in direct continuation of this track. How does the band as a unit go about working out complex instrumental passages, “Echoes Of The Soul” for example has some very intricate changes happening. Kevin: Yep, the instrumental section of Echoes is sure very fun to play! We build those sections though layers of instrumentation, first roughly recording what the ostinato should sound like as we imagine it then working out the precise time changes via putting down time signatures etc. Then I would work out a rhythmic progression, knowing roughly how the symphonic parts will sound and propose to others who will each work out a theme for the progression and find their own way to count the part. We meet up to try various directions and usually after 2-3 iterations we find the one that we feel make us “lock in” usually through smooth resolution of a rhythmic displacement like in Echoes and the end of Fallen Opera. Joe: Yes it can be tough as usually a pattern will be either on guitar or drums first and others have to follow and think of something to add. For example the main pattern on the EP title track was on drums and guitars had to mimic. For Echoes of the soul the passage was on guitars and the drums had to find a creative space…with the aim that it lifts up the track! Do all band members read music and if not how do you convey progressions to each other? Kevin: We have a great mixture of personalities in that sense – Joe and Ludo have more of a classical training background while Dave and I are self taught but have extensive stage/studio experience in various bands across many genres and have developed good listening skills. Everybody in the band has a great musical ear and it is very easy to communicate chord progressions to each other. We are all equipped with pretty decent home studio gear to bounce ideas to each others and personally I do like to see written parts for drums to understand and ride the many time signature changes that OPPOSING MOTION tracks can have. For a track like Rites of Passage, I absolutely had to write each part before tracking it! Can you give us a run down of what gear the band uses and any endorsement deals you may have? The reviews I have seen have all been pretty stellar, has the album been widely liked? Kevin: I must say we have been extremely pleased by the reviews so far. I can remember 2 out of the 20 or so reviews we have noticed that were a bit tougher on us…but that’s part of the game! Those encouraging reviews by big names in the prog world are a great boost as a new band on the international scene but even more important is the feedback from the metal fans and here we were delighted by the messages we received. The album seems to have found its place on people’s playlists and we had some great feedback there too! Echoes of the Soul and Forever’s Edge seem to be hot favourites! Joe: We cannot complain, the reception has been very pleasing and we just hope to keep going and keep improving. You’ve recently released a video for “Forever’s Edge”, tell us about it. Kevin: We are extremely excited about this video. The story line is quite dark but very original; we left it deliberately very open to the viewer’s interpretation even though we have something very precise in our minds…the location – a 19th century painter studio was absolutely spot on in terms of atmosphere and I am sure the video will make a lot of people discover the band. Forever’s Edge was the obvious choice for the video as it displays the most accessible side of our music. Joe: This is our first video and I was really unsure what to expect. The filming was great fun and the end product is exactly what we hoped for. Hopefully this is the first of many…please check it out! What do you see ahead for Opposing Motion in 2013 and beyond? Kevin: A lot of great things! We are already sketching ideas for a new album and we are raising the bar in terms of music writing, taking into account the very constructive feedback from the press and fans alike. This time around, in LION MUSIC, we know we are backed by truly passionate people, which will undoubtedly bring out the best in us. We will keep pushing “Laws of Motion” for the rest of 2013 and early 2014 and try to follow it up very quickly with an even stronger release to strengthen our following in the prog- metal community. This should lead us to start gigging in the next year or so….OPPOSING MOTION is built for the stage! Joe: We are working very hard on a new album, it will be bigger and better for sure. We are also working hard to take things on the road and on stage which will be an exciting time indeed. Anything else you’d like to tell the readers of virtuosityone.com? Joe: And thank you for taking the time to find out a bit more about us, we hope you enjoy the album and keep an eye on us over the next few years. This entry was posted in Interviews and tagged Interview, Opposing Motion, Progressive metal. Bookmark the permalink.